Polished hardwood timber flooring provides a classic and sophisticated look to any home. A beautiful and elegant hardwood floor can easily become ruined in the event of water inundation. It would be normal for many to consider their hardwood timber flooring damaged beyond repair and in need of replacement after such water damage, but the fact is by taking the necessary steps early on you can eliminate the need to replace them. Taking to the task of cleaning up the water and drying out the floors can drastically help decrease the chance of cupping. Cupping is formed when there is a moisture imbalance across the profile of the timber boards. Moisture in the air from humidity is absorbed into the timber and the floor boards will swell and contract as the moisture level changes. When there is an excessive amount of water laying on top of the boards, there is a real chance the boards will swell to a point that they crush each other causing them to deform and cup at the edges. So whether you have a major flood or just experience a localised water spill from say a failed washing machine or dishwater, the need for a quick response using our below tips is paramount. If you think your floors can be dried out and refreshed rather than having to replace them, then there is special drying equipment that forces airflow around and through the surface of the floor to release moisture. There are several steps that need to be followed in order to dry out re-use the original hardwood boards. Most common hardwood floor boards can be dried, sanded and recoated. These types of boards are solid natural timber that have a natural moisture content. These can vary between types of timber, however the fact remains they can accept some level of water before being permanently damaged. The types of timber flooring that typically cannot be dried out and repaired are engineered and laminate boards. Engineered floor boards have layers of plywood with a top layer of hardwood. The plywood will eventually swell and rot when exposed to large amounts of water. Laminate flooring is simply a covering that will bubble and distort. Furniture and rugs will soak up water and retain the moisture until dry. The moisture will seep into the boards, so you’ll need to remove all furniture items and rugs as soon as possible. Getting access to all surface areas will allow a complete and thorough drying process. Remove all excess water laying in low spots. Depending on the amount of stagnate water you can use a mop or a proper wet vacuum. The next stage is to scrub down the entire floor surface to remove any contaminates. So be sure to remove as much as the flood water as possible. Cleaning the floor surface will remove any contaminates from the flood water that may cause damage at a later stage. Contaminants can sit in the pours of the timber and be trapped causing mould to develop. Wash down and scrub the floor surface with a mould removal based disinfectant solution to remove all contaminants. After cleaning the entire hardwood floor surface, mop and/or wet vacuum the area making sure to remove all traces of moisture. As we’ve already covered, hardwood timber is specifically susceptible to mould growth when the moisture content is abnormal. It’s therefore important to ensure the hardwood floor boards and floor structure are completely dry. The most efficient system at drying out the floors is one by using a commercial dehumidifier and blowers and large fans. The dehumidifier sits in the centre of the room/s whilst the fans pointed at the floor boards directs airflow around which boosts the efficiency of the dehumidifier. Leave this system setup for 24 – 48 hours. To allow the dehumidifier to extract the moisture, make sure to open windows only in dry weather conditions. Only once the floors are completely dry can you check for damage and mould growth. If the water was left lying on the floor boards for too long, they would have swell and cupped after a couple of days drying out. Check all boards for cracks, swelling and cupping. If there are signs of damage, then you’ll need to make a decision on whether you replace the individual boards or replace an entire section. Check for and spots or signs of mould growth. A close inspection hopefully will reveal no signs of mould, however if there is suspected mould growth now is the time to have it removed. Clean the affected areas with a mould release agent and roll back over the steps for drying out the surface with the dehumidifier. When all areas have been checked for damage and mould growth, and you’re happy with the results, now you can take a moisture level test in various different spots. Make sure to check many areas to give an accurate reading of the moisture levels. You should aim to have the moisture levels below the natural moisture content level of the timber. After completing the exhaustive steps for drying out the hardwood floors, you now can have them sanded, re coated and polished to bring them back to a beautiful and elegant finish. Freedom Flooring are specialists in hardwood floor restoration. Our sanding and re-coating process can have your water damaged floors brought back to their original elegant look. No job is too big or too small, so give us a call or contact us via the enquiry form. Regarded as a hard wearing surface, solid European Oak timber flooring is terrific at dealing with the increased foot traffic and most importantly looks absolutely divine when sanded & polished with a high gloss clear coating. With it’s traditional appeal and charm, European oak is one of the top timber flooring options for designers and architects..
A style that brings the old back to the majestic. European Oak flooring is provided as either solid oak floorboards or as an engineered oak floor covering. For commercial spaces, the benefit of going with engineered oak flooring is the increased stability that these boards bring. Due to their construction consisting of thin solid oak planks bonded to a base of ply board – gives the boards an increased stability over solid oak boards. The finished product makes the engineered oak floor covering a lot more matched in locations of adjustable humidity – best for heavy traffic areas! European Oak floors exude high-end quality. 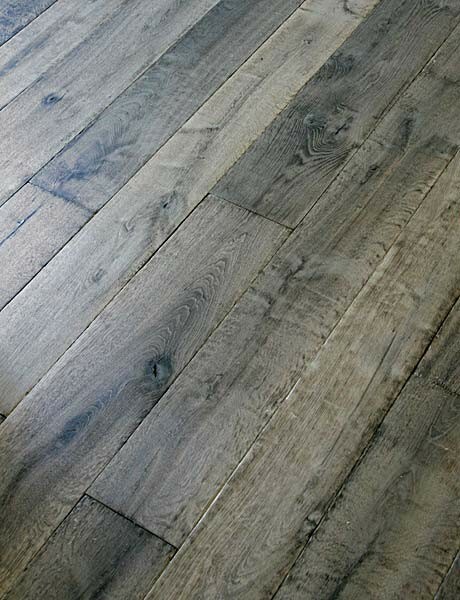 If the budget can be stretched, laying an oak floor no matter what environment will only increase the overall value perception of your project. High-quality oak flooring is created to last a lifetime. If you are looking for a floor that brings character, warmth, and depth to space, the never aging timber will delight the senses. With a wide range of grain and grade, there is a style that will suit your taste and match the decor of your home. Prime grades offer homes with a high end polished appearance, whilst rustic grades display the timber’s natural knots and grains for a more edgy old school traditional look. They say first impressions are very important and with many exceptional tones to pick from, it will give off a great appeal to any room. European oak flooring is well known for very little maintenance. The occasional cleaning and wiping are all that’s needed to keep your flooring looking beautiful. Of course if your European oak timber boards begin to show signs of decay after age, all you need to do is have the floor boards sanded and polished to bring them back to life again. You could go at it DIY mode if you understand the steps to sand timber floors or our professionals can take care of the project from start to finish. For general everyday cleaning, dirt and marks can simply be swept or removed. For more major marks, these can frequently be sanded and re coated with your picked finish – leaving no residues of the original mark. Oak flooring does not emit foul smells and odours like carpet, and spills are far simpler to mop up. European oak is also resistant to fungus and bugs, permitting for a more sanitary home environment and minimizing your maintenance and repair work expenses. Will European Oak flooring work best for your next project? When selecting the grade of oak timber, it’s a simple case of asking yourself two questions. One is whether or not the location of your property is likely going to have fluctuations in temperature and/or prolonged wet weather. Second of all, whether or not you intend on keeping a raw look and feel to the finished floor. If you’re perhaps considering engineered oak flooring, what thickness of floorboard is best for your project? The thickness of floorboards you choose can rely on lots of aspects. If you have got under-floor floor heating, then, normally speaking, you should not set up something thicker than 15mm thick floorboards. Engineered wood flooring should be able to withstand up to 4 re-sand & polish cycles throughout its lifetime. If you do not have underfloor heating, then any thickness of oak crafted flooring will work for you. Generally, the thicker the top layer, the additional re-sands you’ll have the ability to do, which obviously suggests it’ll last longer. So with many different tones and grade, we think European Oak is a floor choice hard to pass up on. Of course if you need help with making a choice, gives our friendly team at Freedom Flooring a call to discuss. Leave a comment below and let us know what type of european oak speaks out to you! 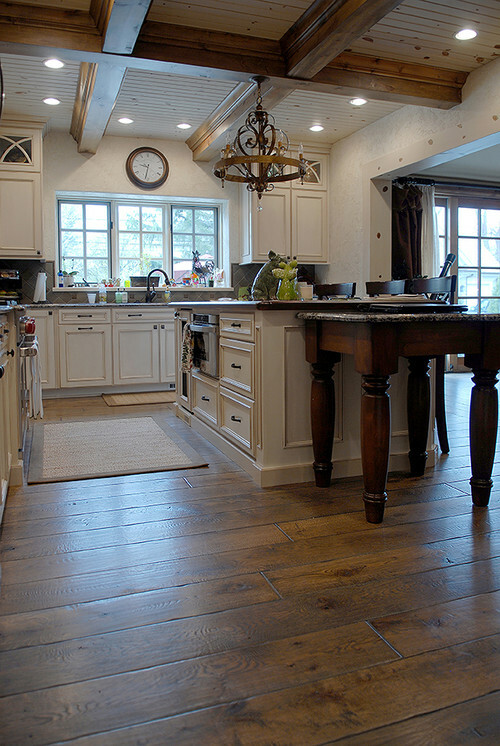 We love the fantastic aged gray oak flooring. Going for that calm, timeless french country look! Whilst the natural and elegant look of hardwood timber flooring can provide an unique and warm feel, there are at times Homeowners with aged hardwood floors experience the creaking and squeaking of the floor boards. Typically these somewhat annoying sounds are the result of a combination of foundation settling and the drying out of the hardwood flooring. So what causes squeaky floors anyhow? Well hardwood has a tendency to shrink & expand depending on the moisture and its density. When your floorboards have dried out they will shrink and start to rub against each other or even the fixtures i.e. nails or screws. In some cases the subfloor could have become unstable and also begin to move under different loads. So in this article, we’re going to look at some variou methods to eliminate those pesky timber floor squeaks. Whether you have access from above or below, these methods will be suited to most hardwood flooring applications. There are two different approaches to consider! If the hardwood floor is on a timber joist & bearer foundation, over a basement or has any type of crawl space underneath, then it’s best to go below to make the repairs. If not, then you’ll have no choice but to perform the repairs from above…Which we’ll get to further on. Before searching for the target repair area, prepare yourself first by purchasing some wedges spacers from your local hardware supplies. These type of wedges from Bunnings will do the trick. So now you have the wedges, you’ll need someone to assist you. Once you have made your way to the area of concern, have someone else walk over back & forth on the floor boards, so you can visualise the specific floor boards that are loose. Hammer a wedge in between the loose floor board and the timber joist. Other types of timber or plastic shims can be used if required. To secure the wedge or packing, use builders glue and insert a timber screw through into the joist. When you don’t have access to the floor structure or joists from below, your only option is to perform the repairs from above. The trick here however, is to silence the squeaks without damaging your hardwood floor. There are some other purpose made products available to secure loose floor boards. A specific type that can work well in most situations is the counter snap screw. Made in the US, the screws are drilled into the problem boards with a special drill head. When the head of the screw hits the top of the fixture, the top 1-inch portion of the screw snaps off at the score, leaving 2 inches of the threaded portion of the screw countersunk 1/8 inch below the floor’s surface. The Counter-Snap screw Kit provides an effective, nearly undetectable way to stop squeaks in hardwood floors. If your hardwood floor is covered over with carpeting, it may be necessary to peel back the carpet and work from the top and countersink screws and nails into the boards. In situations where peeling back the carpet will result in leaving it damaged, then the counter snap screw kit has an additional tool that allows for screws to be drill straight through the carpet with catching on the fibres. There will be a special three-legged depth-control fixture that you will need to position over a joist, then drive in one of the special counter snap screws. The depth-control tool also doubles as the snap-off tool. Insert the screw head into the slot, then maneuver the depth control tool back and forth until the screw breaks off below the surface. As the screw head breaks off below the surface, there will be no visible signs of repair on the carpet. Whilst using one of these repair methods may eliminate your squeaky floor, there is the possibility that new squeaks will arise. When presented with squeaky floor boards and your unsure how to repair them, contact Freedom Flooring for a consultation. Finding a stylish yet functional timber floor that fits in with the aesthetics of your commercial property can be a challenge. The benefits a hardwood flooring can bring to any commercial space, whether it be an office, restaurant, function centre or even a hotel will improve sustainability and remain in style for many years to come. Many people tend to overlook timber flooring for commercial properties, due to its perceived initial expense outlay, however once the advantages are taken into consideration (which there are many), there is a positive response. And we think polished timber flooring ages well when used in commercial properties. In an office space, the timber flooring can elevate the look and feel creating a warm and inviting space to work in. It will remain durable and easy to clean. For high traffic floor plans, the timber floors will hold up well. So what type of hardwood flooring is best for commercial spaces? There’s no doubt solid oak flooring offers the best benefits overall, so let’s take a look at some of the best timber floor options. A medium to large sized board, Brush Box is an attractive timber that is suited for a wide variety of commercial uses. Brush Box timber flooring is very durable with a high density Janka rating, which provides excellent resistance to splintering and wear. The colour tones of the wood grain can vary from a greyish pink to a reddish brown and the sapwood colour is often generally paler. The texture of Brush Box timber is quite fine & even with an interlocked grain. The attractive appearance of Brush Box makes it ideal for use in achieving a high value look in restaurants, bars and other types of function venues. With a variable grain, and moderately course texture, Spotted Gum is a popular choice amongst architects due to its unique waviness. The colour tones vary from a heartwood pale to dark brown or chocolate and its high durability offers a great contrasting colour and practicality for high end restaurants, pubs and clubs. Jarrah is commonly rated as a highly durable timber against decay and is resistant to insect attack. Commercial flooring that integrates outdoor landings will benefit highly from the use of Jarrah. The grain tends to be interlocked or somewhat wavy consisting of a medium to course texture. Sometime exhibiting a curly figure, Jarrah contains naturally occurring streaks throughout. Colours ranging from light red or brown to a much richer red, though it tends to darken when consistently exposed to light. Because of its great durability and common availability, Jarrah is a very useful timber for commercial projects with exterior integration. So getting the perfect look for your commercial property means you need to pick the best timber for the purpose. Taking into consideration of the three different types featured above, we now take a look at some of the practical considerations you should apply that will ultimately point you towards the right choice. Not all timber types are ideal for all locations. You should consider being proactive and collaborative with an architect, designer or perhaps even manufactures to determine the absolute best type of hardwood timber to use for your commercial property. High traffic levels require a high density timber that can withstand the constant and heavy traffic across the boards. So commercial properties like schools, airports, shopping centres and others of high public congregation often feature a hardwood flooring type that can withstand the high wearing and heavy traffic for many years. The ease of maintaining the floor and performing repairs when it starts to wear should be of high importance. If a commercial property has hallways, and/or spaces that only allow singular lines of traffic through, then considerations need to be made for the flexibility of maintenance and repair. It is inevitable in these situations that over time hardwood boards will wear, split and require sanding or replacing. Cost of labour can be expensive, so getting the right timber species for the space can yield dividends in return over the long term. The life expectancy generally goes hand in hand with the first two factors, though some timber species have a longer service life under standard use than others. Proper timber selection and maintenance will provide a long term service life. Other considerations can be the supplier and/or installer of the hardwood flooring as the quality of the boards and the installation methods will have an attribute as well. So that’s a snapshot at how we recommend choosing a high quality timber floor for your commercial space. The team at Freedom Flooring can assist you with product selection as well as any design and installation work.